Leading tool manufacturer, Hilti is upgrading the protection for its employees from workplace incidents through the use of latest Identicom lone worker protection from Rotherham company, Connexion2. Hilti provides leading-edge technology to the global construction industry and has been a customer of Dinnington-based Connexion2 and long-term Identicom user since 2010, has now upgraded to using the 8 series Identicom lone worker device with additional functionality to improve safety, give peace of mind to staﬀ, and increase ﬂexibility. Designed to look like a normal ID badge, the Identicom system allows lone workers to raise an alarm, make an emergency phone call or send a text message. It is part of the lone worker solution SoloProtect, which includes the device, 24/7 manned monitoring, SIM card, mobile network usage, training, inclusive billing and monthly reporting. Hilti are continuing to equip lone workers with Identicom in their retail stores, nationwide. 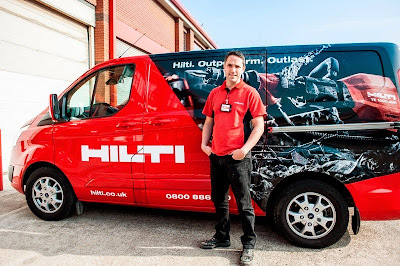 The company, whose trademark red power tools are used on construction sites around the world, operate a direct sales model which includes 21 Hilti Centres across the UK. Stuart Lamb, National Hilti Centre Manager, said: "The protection of staff is paramount, and having experience using the device, we know that it works, and we've always received great customer support from SoloProtect. In the past we have had an incident where a member of staﬀ has been threatened, we also know that staff can be happy and comfortable with their device and this is why we have chosen to upgrade and expand our Identicom units." Identicom and SoloProtect provide an innovative solution to the problems of verbal abuse and physical assault in a retail setting, by enabling the lone worker to discreetly obtain help at the push of a button, without breaking eye contact with an aggressor. Once an alert has been raised this then goes through to an approved 24/7 Alarm Receiving Centre (ARC) where a dedicated member of the lone worker team can listen into and access the situation, and escalate to police if necessary. Identicom also has a "Man Down" function that raises the alarm automatically should a worker lose consciousness due to a slip or fall, or an unknown health issue. Craig Swallow, managing director of Connexion2, said: "We're really pleased that Hilti continue to see considerable value in the SoloProtect service we provide to their lone workers. Retail continues to be a sector that is increasingly waking-up to the risks facing staﬀ working alone, whether it be for a limited time or the majority of a working day."